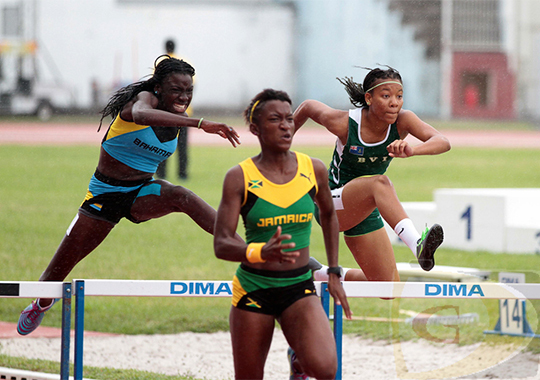 Deya Erickson, right, enroute to running a personal best and National Youth Record in the U18 Girls 100m Hurdles and placed fifth in the final. FORT De FRANCE, Martinique—British Virgin Islands athletes walked away from three days of stiff competition against the region’s best in the 43rd Carifta Games that wrapped up in Fort de France, Martinique last night, with five important qualitative statistics—personal bests set, medals won, National Youth and National Jr. Records broken and three IAAF World Jr. Championships qualifiers. When the last runner crossed the line, the BVI had amassed four bronze medals bringing the overall total since 1978 to 37—18 of which have been won since 2011. Sprinter Nelda Huggins dipped under 24.00 seconds for the first time in her career when she placed fourth in the U18 Girls 200m in 23.91 seconds to take down Chantel Malone’s four-year old National Jr. Record of 23.97. Huggins’ race had a +0.9 wind reading and demolished her 24.24 best from last year. Her mark is also a National Youth Record. Seeking to add to her Discus Throw bronze from Sunday, Javelin Thrower Tynelle Gumbs had to settle for fourth place after a best measurement of 37.90m. She mined U17 gold in 2012 and U20 silver in 2013. Deya Erickson started the last day of competition by advancing her first U18 Girls 100m Hurdles final where she finished fifth in 14.32 seconds. She ran a personal best of 14.16 in the semis to place third in a National Youth Record. Lakeisha “Mimi” Warner saw her 2-year run of Carifta bronze medals end when she placed fourth in the U18 Girls 800m in 2 minutes, 15.84 seconds. Tarique “Tweety” Moses had a non-qualifying time of 2:04.23 in the U20 Boys 800m. The U18 Girls 4x400m quartet of Warner, Zacharia “Zakie” Frett, Beyonce DeFreitas and Judine Lacey, finished in eight place. Lacey was making a back stretch move when the stick fell from her hand and she hat to retrieve it. They finished in 4:00.37 seconds after running 3:49.60 to place third in their heat. Arianna Hayde continued the stellar performances of debutants when she finished seventh overall in the Heptathlon with a National Youth and National Jr. Record of 3,769 points, which came after winning her 800m heat in 2 minutes 40.39 seconds—good for 4th overall. Only Kanishque “Kadi” Todman’s 4188 points from last year is better. Akeem Bradshaw missed his U18 Boys Long Jump personal best by .01 cms when he cut the sand at 6.91m to finish sixth, while Kala Penn had an unlooked for 12th place finish in the U18 Girls Triple Jump after leaping 11.27m. Kadeon Potter had an Under 18 Boys Shot Put throw of 15.02m to place fifth in the competition. In the U18 Boys High Jump, Tahj Malone cleared 1.90m to place ninth overall.